West Palm Beach, FL - Recognizing the need for an online digital presence, Amy Yedinak, President of A. K. Government Solutions reached out to local West Palm Beach Digital Marketing Agency, THAT Agency, to bring her company online. 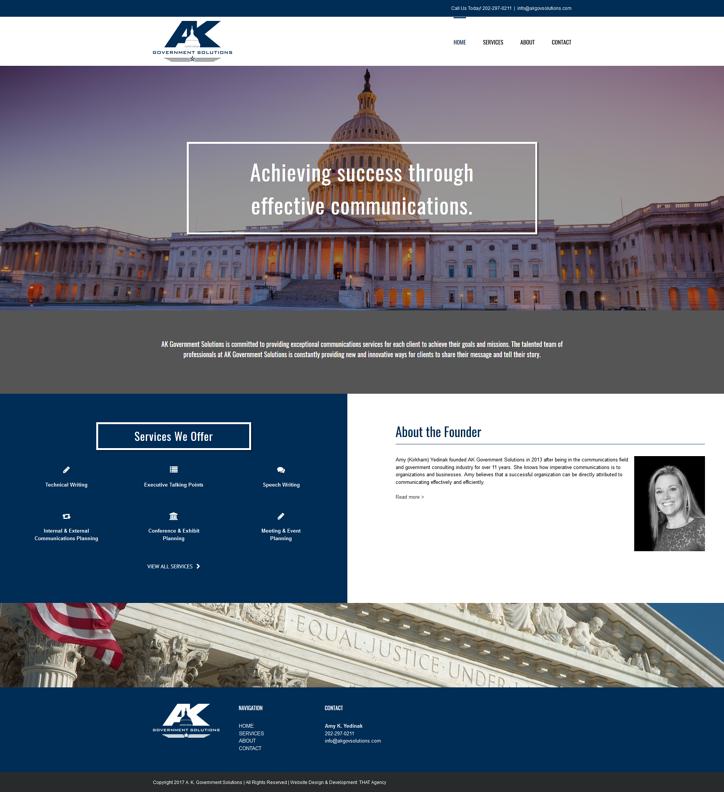 With the majority of their clients residing in Washington D.C., and their specialty in government communications, the new website needed to reflect a corporate image, while incorporating modern element and UX/UI for usability. The responsive website was developed on a WordPress platform, and allows A. K. Government Solutions to manage all elements of their website through a content management system (CMS). The modern website design, features a full-width layout, large imagery and clean fonts. After being in the communications field and government consulting industry for over 11 year, Amy (Kirkham) Yedinak founded AK Government Solutions in 2013. A. K. Government Solutions has a vast amount of experience and knowledge in the continually changing communications industry. While the company has only been established for a relatively short time, there is vast amount of experience (approximately 20 years) and knowledge in providing communications services to clients from various government entities. This experience and talent has recently led AK Government Solutions to become the Communications Lead for several high-profile programs within the Federal Aviation Administration (FAA). For more information, visit the new A.K. Government Solutions Website or call (202) 297-0211. THAT Agency is a full-service interactive design agency whose focus is all about their clients, including their web designs and development, search engine optimization and pay per click management and social media marketing. THAT Agency also provides business planning services, such as: specification documentation, wireframes and competitor analyses, for companies of all sizes, from start-ups and sole proprietorships to Fortune 500 corporations. For more information about all of the digital marketing services THAT Agency offers or to get a quote, visit www.thatagency.com or phone (561) 832-6262.